Dale Cox is a writer out of the famous town of “Two Egg” of Jackson County, Florida. He has been doing a lot of research and writing about the First Seminole War and the history of the Florida panhandle area. It is an excellent telling of her early life. I don’t think anyone else has compiled as much about her, and attempted to separate the facts from the folklore. Her actions of saving the American soldier made headlines across the country, and Dale says that this is the beginning of Americans looking at Native Americans as real people, and developing sympathy against removal. Twenty years later, there was quite a movement, mostly in the northeast of Christian missionaries, of against the removal of the tribes in the southeast. It also seems to have coincided with the abolitionist movement. 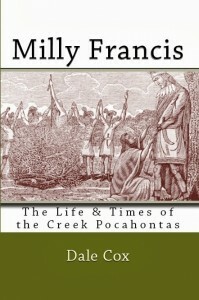 Milly Francis was the first woman to receive a congressional medal. She was given the medal on her deathbed in Oklahoma, along with a government pension payment of around $451. There is much that is not said about Milly. There is a lot of oral history among her descendants, and I would have liked to have heard more of that. But like a lot of other ground-breaking historical research books, more pieces of information becomes available once the book is published. I am sure this will not be the last word about her, but hopefully the beginning. Dale explains how this was the key that set in motion a lot of events, and set in motion the whole Seminole war / removal that lasted the next 42 years. And he explains how the American attack on Fowltown was unprovoked. It caused the Red Sticks to retaliate by attacking the supply boat going to Fort Scott a week later. This was the worst case of yellow journalism where the press suddenly started to add further inflammatory details to sell their papers. And there is much more to say, but I will leave that for another time. 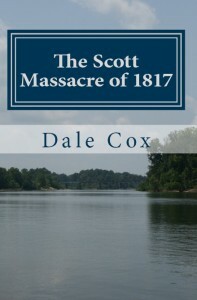 John and Mary Lou Missal are also working on a book about the Scott Massacre and Mrs. Stuart. Mary Lou was working on this book when we met years ago, but they have since published about eight or so other books, but are now getting back to Mrs. Stuart, which I think was Mary Lou’s first love for publishing. 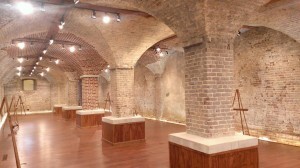 It is the reconstructed powder storage for the Chattahoochee Arsenal in Chattahoochee, Florida. This was an important place where weapons and gun powder was stockpiled in the Second Seminole War. It will open as a museum in a few months. The officers’ quarters built in the 1830s are nearby. The floor of the powder storage was wood like this, to keep the powder off the moist ground and was built in such a way that air would flow through the structure to try and keep it dry. In original powder storages, they also used only brass nails and brass fixtures, that do not create a spark when hit—you can probably guess why that is important where you have powder stored. So soon in Chattahoochee, they will have a small museum in the powder magazine about the involvement in the Seminole Wars. There are also some historical markers being made about the Scott massacre, and the meeting between Josiah Francis (Milly’s father) and British Marine Colonel Nicholls in 1815. More on that later. very interesting! Thanks for the links to Cox’s website. Glad you enjoy it! Dale and I have been researching the same things. I am working on another blog entry for Lake Jackson as I add this comment.